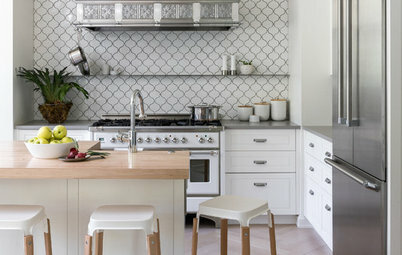 Many of interior designer Alicia Sass’ clients ask her to open up their kitchens by taking down walls — but that wasn’t the case in this beautiful and formal Victorian-era home in Toronto. 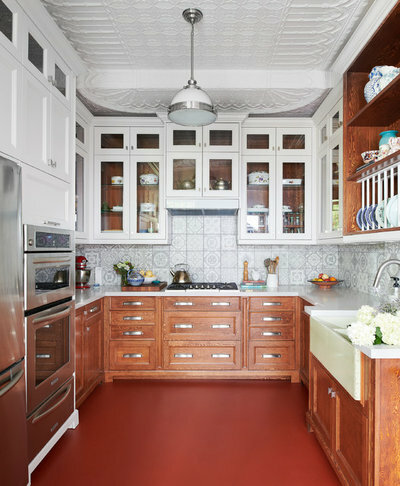 The home had many of its wonderful original details intact, such as a tin ceiling and intricate moldings, and Sass worked closely with the homeowners to keep the spirit of the 100-plus-year-old home alive. 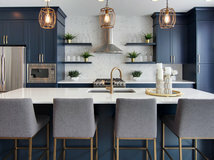 But the kitchen needed some updates to make it functional for modern life, so the designer carefully balanced those two priorities in the design. 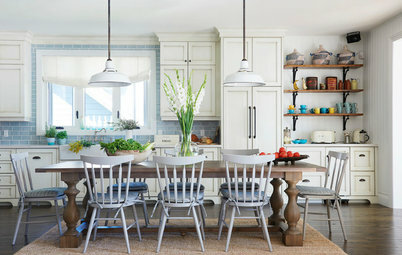 The result of the full kitchen renovation is a room with collected style that honors the home’s history. Design is a collaborative process, and together with her clients, Sass made sure their personalities would be evident in the room. 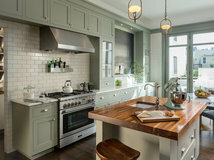 They shared photos of kitchens they liked from online resources such as Houzz and photos cut out from their favorite magazines that featured traditional English country house style. “They knew exactly what they wanted,” Sass says. 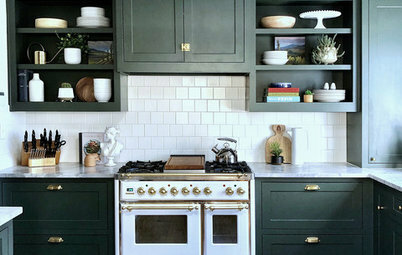 For example, they chose this attention-grabbing antiqued green porcelain apron-front sink because it was “them,” and Sass provided lots of opportunities to display their antique china and glassware by using glass-front cabinets. 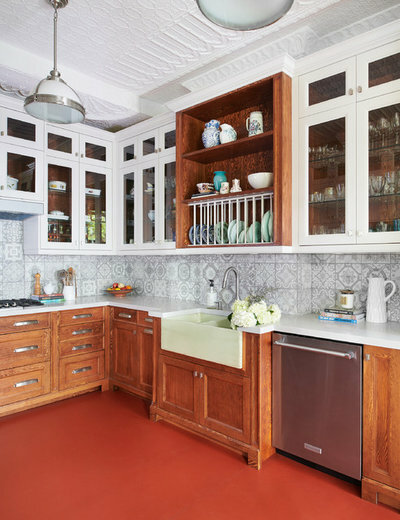 They also wanted the kitchen to be durable and easy to clean and chose the red Marmoleum floor. 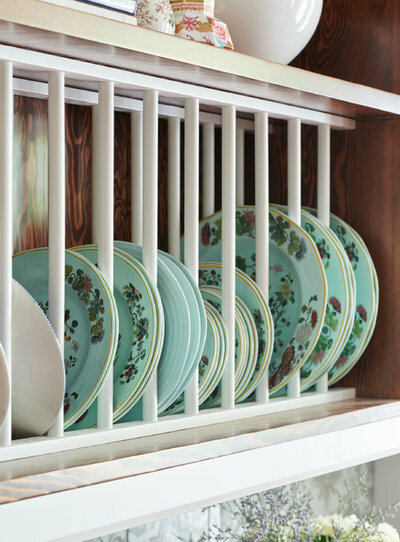 The plate rack, like those they had admired in English country homes, not only fits the era of the house, but it puts their favorite dishes on display and makes them easy to grab when setting the table. Before: This was the entrance to the kitchen from the dining room. The peninsula was clunky and hard to navigate around. Many of the homeowners’ favorite antiques were relegated to the top of the cabinets. And the kitchen didn’t have Victorian-era style. After: Now that the peninsula is gone, the kitchen is a wide, functional, U-shaped galley where the couple can enjoy prepping and cooking together. It’s also much easier for extended family to enter and hang out in the kitchen. The sink and dishwasher were moved across the room so Sass could place the more modern fridge and ovens out of the dining entry view. The trash and recycling bins are hidden behind the cabinet door to the left of the sink. 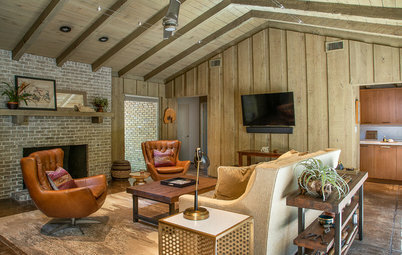 The original tin ceiling and ornate trim where it meets the tops of the walls were must-keeps. 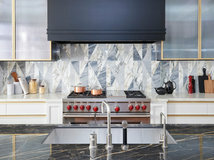 So rather than having the cabinets touch the ceiling, Sass had them sized to preserve these important features while still giving her clients extra display cabinets above the uppers. 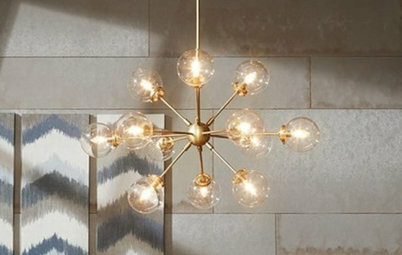 The contractor had experience in working with tin ceilings, so he was able to install the lighting where Sass wanted it and maintain the ceiling’s integrity. 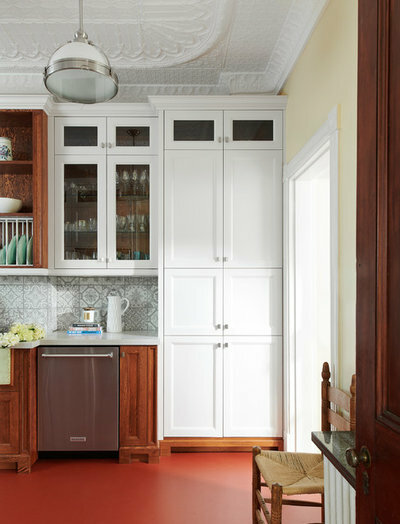 The cabinetry also fits in with the historic look. Sass mixed white, glass and stained Douglas fir in a careful balance, knowing that putting the wood everywhere would have darkened and weighed down the room. But she did use it inside the glass-front cabinets as part of the balancing act. 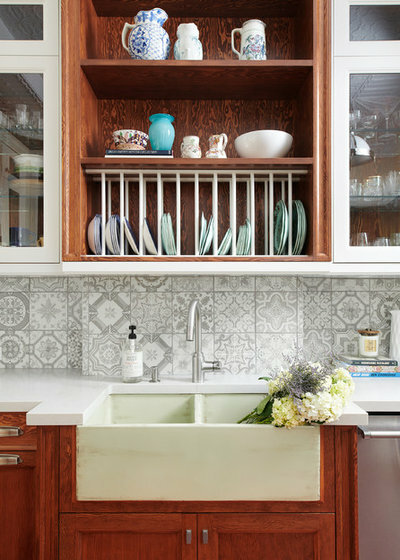 The way the sink juts out and the feet on the bottom of the other cabinets give them a freestanding furniture look that would have marked a Victorian-era kitchen. 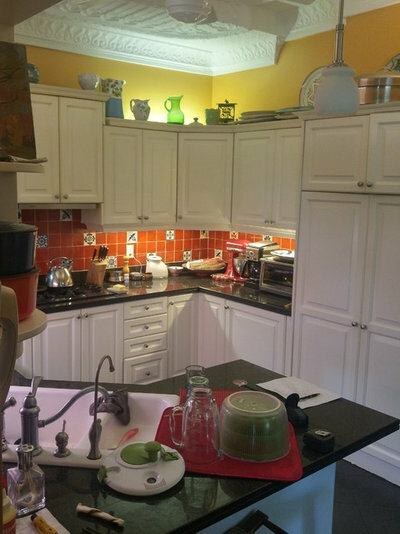 And note the way the plate rack and shelves above it help break up the modern look of the upper cabinets. 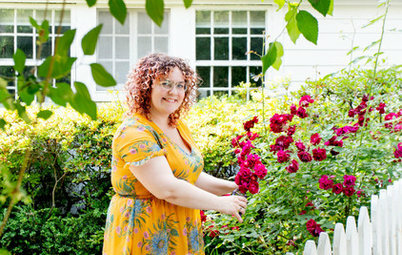 Before: “The dining room has beautiful old Victorian gold-gilded paneling,” Sass says. But the modern appliances were the first thing the homeowners saw when they entered their old kitchen from there. 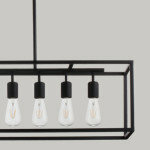 The transition needed to be less of a jolt and make the spaces feel more cohesive. Sass concentrated the ovens, speed oven, warming drawer and refrigerator on the opposite kitchen wall so they weren’t immediately visible upon entering. 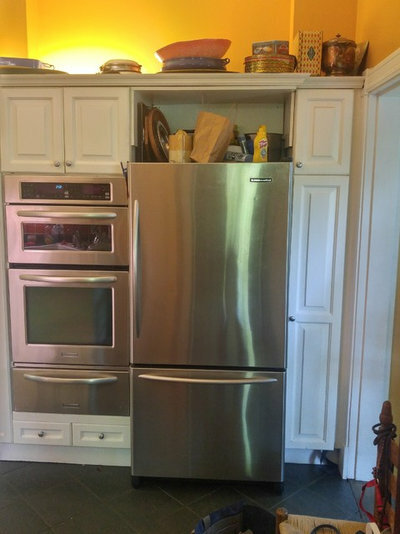 “Flipping the appliance wall kept a much more open, light and airy feeling in here,” she says. The couple had bought the appliances just a year before renovating, so they were worth preserving. This is the same view now, complete with pantry cabinets and glass-front cabinetry that shows off the owners’ glassware. 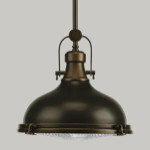 Sass chose pendant lights with a simple, traditional vintage look so as not to distract from the tin ceiling. 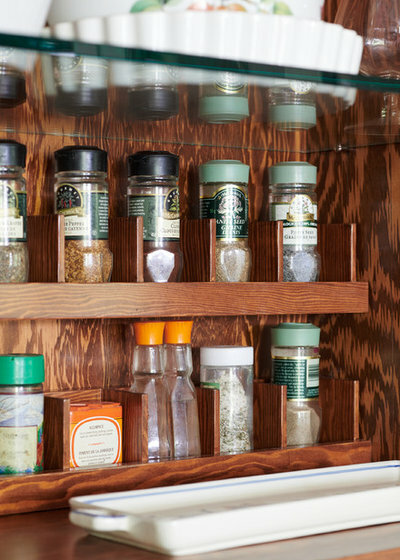 Items such as spices, knives and trays have their own specially outfitted storage spots behind solid doors and in drawers. The kitchen needed surfaces that could stand up to the hard work the homeowners enjoy performing in the kitchen. In addition to the Marmoleum flooring, the Caesarstone quartz counters and ceramic tile backsplash can handle spills and splashes and are easy to clean. These materials mimic the look of more historic design elements, but modern technology makes them more resistant to damage. This end of the kitchen leads to the newly renovated mudroom on the left and to the dining room on the right. The mudroom was also part of the project. Floor plan. 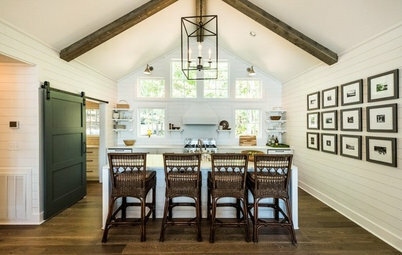 The opening to the dining room is at the top left and the entry to the mudroom is at the lower left. 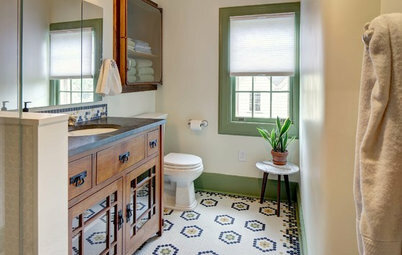 When renovating, be true to yourself and make sure your voice is being heard by your designer. 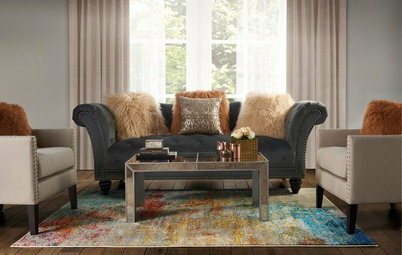 Read more about how to work with an interior designer. Determine your must-haves early on in the process. Here, it was saving the footprint and original moldings and incorporating display for antiques. Listen to your home. 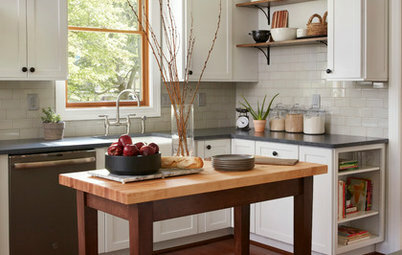 Just because everyone else is taking down walls to open up a kitchen doesn’t mean you have to. 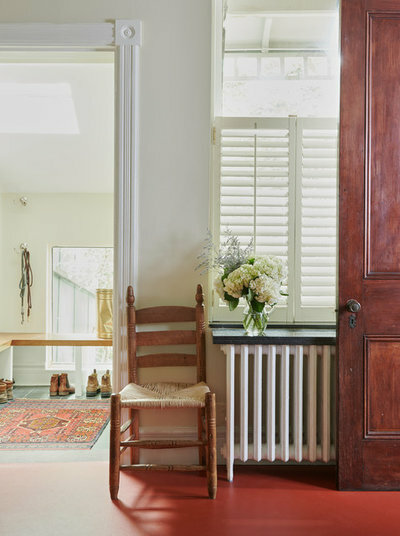 Find a designer who can meet the challenge of saving original features — be sure to bring things like that up at your first phone conversation and meeting. 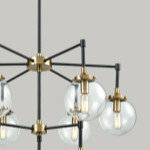 You’ll be able to sense the designer’s enthusiasm (or lack thereof) and determine whether it’s a good match. 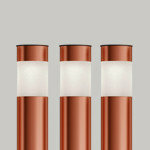 Check out the designer’s Pro profile page to see if any of their work lines up with what you have in mind. Take inventory what you’d like to show off in glass-front cabinets and plan accordingly. Think about the view of the kitchen from other rooms. 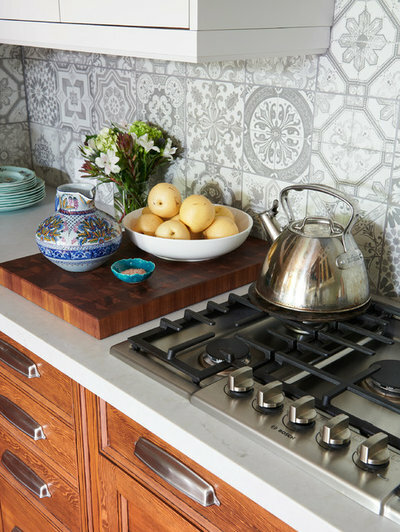 Talk with your designer about how hard you are on a kitchen so you can factor in the durability of the materials you choose. What is a magic corner? 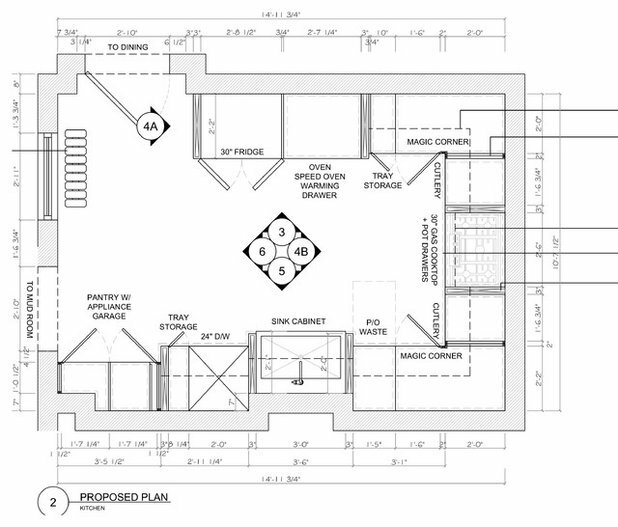 I noticed two in the floor plan. @Janet Kofoed: It's their trash and recycle bins area. The other one is for trays and storage - there are corner pullouts to make max use of the corners. Guess they just called it "magic" corner. @Janet, a Magic Corner is like a lazy Susan but there are pull-out shelves to make it easier to reach things.